Now featuring a striking, modern, and refined design, a brand new interior layout, more technology, more efficient engines, and a host of other improvements, GMC’s midsize SUV is now more competitive than ever. Completely redesigned for 2017, the Acadia GMC has been improved in every way. Now featuring a striking, modern, and refined design, a brand new interior layout, more technology, more efficient engines, and a host of other improvements, GMC’s midsize SUV is now more competitive than ever. The 2017 GMC Acadia is 18 centimeters shorter than the previous generation, making it more suited to city driving and parking while still offering plenty of interior space. Plus, its overall width has decreased by 9.2 centimeters. It is also lower which facilitates access on board. 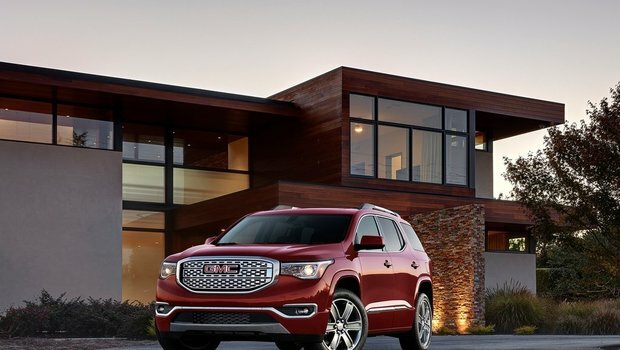 The GMC Acadia has long been considered one of the most spacious mid-size SUVs on the market. The 2017 model now offers 2,237 liters of total cargo space when you lower the rear seats, and 1,180 liters of cargo space with the second row of seats up. Even with the third row of seats in place, which allows you transport 7 passengers, you still get almost 400 liters of cargo capacity. 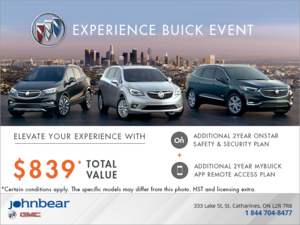 Available starting at $35,095, the Acadia 2017 is available with either front-wheel drive or all-wheel drive. The 2017 GMC Acadia features a leather-wrapped steering wheel, 7-passenger seating, stability control, Bluetooth connectivity, 4G LTE connectivity with OnStar support and Wi-Fi access, 17-inch wheels, LED traffic lights, and Apple CarPlay and Android Auto functions. There is also a rear-view camera and 8 airbags. Next in line, the SLE-2 trim offers a six-seat configuration, heated front seats, 18-inch wheels, power tailgate, remote starter, and fog lights. The SLT-1 trim adds blind spot monitoring, parking assistance, perforated leather seats, an 8-speaker Bose audio system, a 120-volt power outlet, 18-inch wheels, and rear cross traffic alert. The first is a 2.5-liter four-cylinder engine developing 193 horsepower and 188 lb-ft of torque. A six-speed automatic transmission is standard. This engine proves to be one of the most fuel-efficient in its class with an average fuel economy rating of 11.2 liters per 100 kilometers in the city and 9.4 liters per 100 kilometers on the highway. The other option is a 3.6-liter V6 engine that is available only with all-wheel drive. This engine offers 310 horsepower and 271 lb.-ft. of torque, and its average consumption on the highway is 9.5 liters per 100 kilometers, similar to the four-cylinder engine despite the extra power. The 2017 GMC Acadia has a maximum towing capacity of 5,200 pounds. To learn more about the 2017 GMC Acadia, contact us today at John Bear GMC Buick in St. Catharines, Ontario!